A school dinner lady has been jailed for six months after she drove to work while nearly six times over the limit. 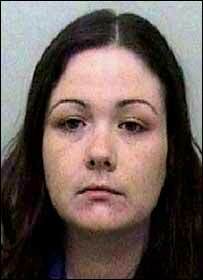 Catherine Bickerdike, 29, of Warton, Lancashire, was sent home from the school because she smelt of alcohol. When breathalysed she gave a reading of 183 microgrammes of alcohol in her breath - thought to be one of the highest readings recorded in the UK. At Preston Crown Court, Bickerdike, admitted dangerous driving and drink driving and was jailed for six months. She was also banned from driving for four years at the hearing on Tuesday. Hilary Banks, prosecuting, told the court that Bickerdike, who has a six-year-old son, was spotted driving erratically in her purple Volvo on 21 June by electricians, Alan Thorpe and John Moffatt. The pair saw Bickerdike swerve round a roundabout, mount the kerb, veer over the road and narrowly miss two lampposts. As the vehicle stopped at traffic lights, Mr Thorpe took the decision to put his vehicle diagonally in front of her car to stop her and he went and spoke to the driver. Mr Thorpe said to Bickerdike: "Get out of the car. You are either drunk or on drugs and going to kill yourself or someone else." Bickerdike replied: "Get back in the van. I'm alright. I am just going home." As his work colleague called the police, Mr Thorpe returned to his van. Bickerdike "squeezed past" his vehicle, hitting the bumper, and drove off. The workmen followed and saw her park up at home before she "staggered" to the front door and went inside. Police arrived minutes later and arrested her. Simon Newell, mitigating, told the court that Bickerdike had previously led a "small and ordinary and law-abiding but uneventful life". She split from her husband in July 2004, which led to depression. She started drinking but was not an alcoholic, Mr Newell said. Judge Christopher Cornwall told Bickerdike: "A significant aggravating feature is the fact that Mr Thorpe and Mr Moffatt tried to stop you. You rebuffed their attempts. "The scope for death and devastation likely to have resulted from your driving in your condition was very, very considerable."